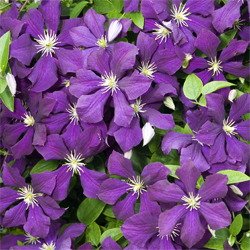 When it comes to flowering vines, few can rival the excellent performance clematis provides with its profusion of colorful blooms, and this plant is largely pest-proof and disease-free. With a few tips, you can successfully grow America’s favorite vine in your garden this spring! 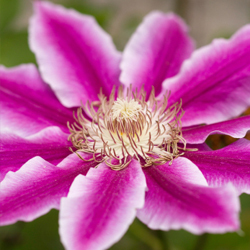 Clematis comes in a wide variety of colors: purple, pink, red, lavender, mauve, blue and white as well as blends of more than one color. There are over 200 varieties in all, and most plants bloom for several weeks in May and June with a few sporadic flowers in fall. Others bloom in summer, and a few varieties flower from late summer into fall. Clematis performs best in a spot that gets at least 6 hours of sun a day – this is especially true with later blooming varieties like ‘Lady Betty Balfour.’ They also need moist, well-drained soil. Because clematis climbs by curling or twining leaf tendrils, stalks or stems around a support system, a location with a trellis, arbor or fence is essential to provide adequate structure so the plant can show off its full beauty. To give clematis a good start in your yard, dig a hole slightly deeper than the rootball of the plant and twice as wide. Add about one-third peat moss, compost or other organic matter to your soil to provide sufficient nourishment. 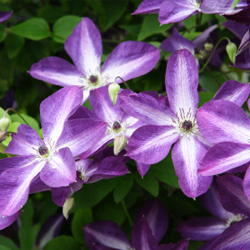 Clematis prefers a neutral pH, so you may need to amend the soil with lime if your soil is acidic. Without handling too much, plant the clematis rootball slightly above the ground and water well with plant starter fertilizer. Next, add about 2-3 inches of mulch, but keep the mulch away from the stem of the plant so as not to encourage stem rot. This layer of mulch is important because clematis prefers cool, moist roots. The mulch will also discourage weeds while the plant is getting established. Type 1: Early Flowering Clematis (macropetala, alpina and montana types) – These plants produce flowers on wood that was grown the previous year and should be pruned within a month after flowering in the spring. Thin out weak or dead branches, lightly prune side branches to 1-2 buds and leave the main branch alone. Train or guide branches as required. Type 2: Early Large-Flowering Clematis – These varieties bloom on the previous season’s wood and on new shoots, blooming from early to late summer. These varieties should have one-half of the previous summer’s growth pruned back in late winter before new growth starts. Remove dead or damaged stems and cut back all other shoots to where strong leaf-axil buds are clearly visible. Immediately after flowering, cut one-quarter to one-third off the main shoots to within a foot or so of the base. Water and feed well. Train or guide new growth as required. Type 3: Late Small- and Large-Flowering Clematis – Cut these types back hard to the lowest pair of strong buds on each stem (usually about two feet) in late winter just as leaves begin to open. These varieties will bloom on wood produced in the upcoming spring months. Clematis should be fed monthly during the growing season with 5-10-5 fertilizer or in early spring and again in early summer with a slow-release fertilizer. You will also want to check the pH of the soil periodically to keep it neutral, and refresh the mulch as needed to protect the roots. With just a little care and appropriate pruning, these lovely vines will bring gorgeous color and structure to your yard for years.